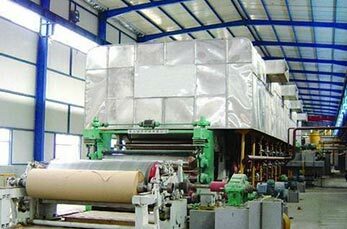 In Zambia, paper making industry has a very good development prospects and our company have established good cooperation relations with many paper mills in Zambia. In 2013, the customer from Zambia got in touch with us, they stated that their paper mill planed to improve the exsiting 7T kraft paper turn key project, and purchased some machines from our factory with our visiting. During those two years communication, customers have visited our factory 3 times. On August, Leizhan engineer was invited by Zambian customer to visit their factory to help them improve the old production line’s capacity and paper’s quality,meanwhile to set up new turn key project. Now, the two companies has established the good cooperation, hope both of us can cooperate very well in the future. D type hydrapulper applied to energy-saving cast steel VOKES rotor strengthens hydraulic circulation and fiber relief. Pulp chamber of rotor is higher than the undersurface of pulper barrel, form a low pressure area around ortor to colect heavy impurities, reduce wear to cutterhead and sieve plate. So that can prolong the rotor and sieve plate service life. Adjustable gap between rotor and sieve plate ensures the pulping effect.